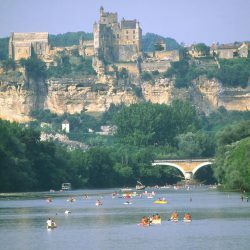 15km from the campsite, discover the charming village of Beynac and Cazenac located on the banks of the Dordogne. Renowned for its imposing castle, once besieged by Richard the Lionheart, the stronghold will seduce young and old lovers of history. 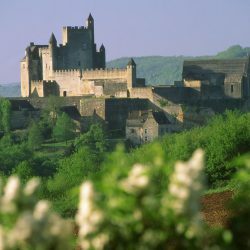 Visit the mighty fortress erected on its rocky peak built in the 12th century, facing the castle of Castelnaud and at the foot of which lie charming houses with lauze roofs and blond facades. Girdling the castle and located below, the village is discovered with pleasure. Stroll through the picturesque streets and alleys and enjoy the charm of this medieval village, considered, rightly, as one of the most beautiful villages in France.